I do really like the colors on this cover and how muted they are. The face that is transposed over the forest is pretty cool also. I've been sitting and trying to write this review for about the last 20 minutes, and I still don't know exactly how to express my feeling about this book. Disappointment reigns supreme right now, but I also have an appreciation for the writing in the book so I'm at war with myself. Be warned that the following review may be rather long and rambling. I'm going to try to explain everything I'm currently feeling. 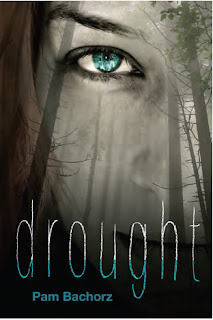 First off, Drought definitely drew me in with its unique premise. I liked that Ruby and her community were trapped in an early-nineteenth century lifestyle because it gave the book an interesting twist. Their clothes were simple, their homes were simple, it was their lives that definitely weren't. Darwin West is their captor and he demands that they collect the water that heals and renews. He doesn't know the secret of how it is obtained, only that these people are the only ones who can collect it. All of that was pretty intriguing and led to a nicely paced plot. What really threw me off was how flat all the characters felt to me. There is no emotion in the book nearly at all, expect for what Ruby feels towards Ford. These oppressed people all seem so okay with their stake in life that it drove me nuts! I wanted to scream at them, and sadly I slightly felt like they deserved their place in life if they weren't going to try to change things. It was only Ruby, who was deemed a rebel, who wanted anything different than what was given to her in life. Looking back I suppose this was important to the overall story at times, but it made for a very dry read. My other issue was simply that there are so many questions unanswered at the end of the book. I'll admit that the real reason I actually read so fervently to the end wasn't because I was invested in the story or the characters, but because I really wanted to find out what was going on with Ruby's blood and the mysterious Otto. Unfortunately I wasn't given very much more information and I left the story behind feeling very dissatisfied. There isn't any hint toward a sequel either, so I'm kind of at a loss as to what actually is going on with these people in the story. Long story short, I did like the writing and the setting of the story. It was interesting enough to keep me reading at the beginning. However the attitude and the cult mentality of the characters was dry very quickly, and I found myself lost in terms of understanding exactly what was going on wit them. Overall I'd say that I enjoyed this story enough to recommend it as a library read. I always say you might enjoy it more than I did!